It’s “Say Something Sunday,” a day dedicated, at least on this blog, to personal Size Diversity activism. I’ve got some suggestions below and/or of course you can do your own thing and feel free to leave a comment about it. 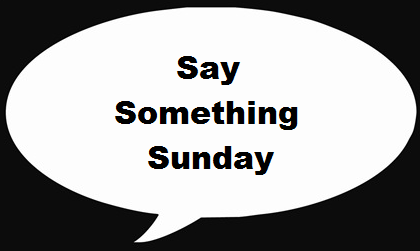 If you have ideas of things to do for Say Something Sunday I’d also love for you to share those. I did the math and if everyone who views the blog each week did one piece of Size Diversity Activism a week, it would add up to over 1.5 million body positive messages put out into the world this year. Multiply that times the number of people who might see each of those messages and things start to increase exponentially. To be very clear, nobody is obligated to do activism so if this doesn’t appeal to you that’s totally cool, I’ll be back tomorrow with your regularly scheduled blog post! Write a letter to your body thanking it for everything that it does for you (breathing, blinking, hugging whatever). Tell you body that you appreciate it, even if there are some issues that you need to work out. Publish the letter in a blog, on social media etc. Thank someone who has helped you on your journey – send them an e-mail, post it to social media, leave a comment etc. When you see a publication (digital or print) that posts an article on body positivity/Size Acceptance etc. leave a positive comment and write an e-mail to the author thanking them for covering these issues. Have a great Say Something Sunday! I’m booking talks for Spring and Fall of this year. If you want me to come to your school, business, or organization (even if you’re not sure how to get it done), just e-mail me at ragen at danceswithfat dot org and we’ll talk about the options. If you want to bring me to your community but don’t have funding or an organizational affiliation, I can help you with that too – e-mail me and we can talk about the possibilities. See you soon! A movie about my time as a dancer is in active development (casting, finding investors etc.). Follow the progress on Facebook! This Say Something Sunday I am sending emails out to all my friends and family discouraging them from vacationing in California. As my lawyer told me, California is one of the only only places in the world that by LAW AND STATUTE recognizes the links between obesity and certain illnesses. This may not seem like a big deal but what it means basically that if you try to bring a malpractice lawsuit in California as a fat person, Medical malpractice insurance companies and doctors will argue (with 99% success as my lawyer explained to me) that your problems came from being fat AS RECOGNIZED BY CALIFORNIA LAW! Despite loads of legitimate research from those trained how to conduct heath related studies and statistics like Linda Bacon and Ragen Chastain, that than being NOT FAT (or thin) is a measure or worth, a barometer of health, nor EVEN WITHIN OUR CONTROL! This is the underpants rule of course, so you don’t have to participate but if you or anyone you know was planning a trip to California, please reconsider. Let’s hit them where it really counts, in the pocketbook. Can you imagine something as powerful as Disney Land bearing down on the state legislature if all the sudden their ticket, souvenir and food vending sales dropped by half and cost them a few billion dollars in lost revenue? I learned yrs ago that Saudi oil sheiks own quite a large portion of EuroDisney, and who knows how much in other disneys. I’d rather they not get my money either. No Disney for me. I know the only state that makes it criminal to judge based on appearance and discriminate, is Michigan. I’ve considered moving there. Canada does not enshrine fat in the Charter of Rights and Freedoms. As a resident of California … that pretty much terrifies me. 1. Harassing a customer about what they look like AS SOON AS THEY COME IN is not giving them a comfortable experience. You can’t blame them for walking out. 2. When, AFTER CRYING, they come back in to get food to go (so the gas money they spent to come there, as well as the gift card they got FOR CHRISTMAS, isn’t wasted), DO NOT REPEAT. I’ve always had a good time previously at this (Name of restaurant here, don’t want to embarrass possible good franchises by putting it out there), but now I can’t trust safely coming in. The only positive I want to add: the hostess/waitress that brought me water while I was upset has excellent skills you all should learn from. I was at a public health conference today. The speaker was talking about how obesity is a public health emergency, blah blah blah, you know how it is. It was part of a larger presentation, but I approached him after the talk, asked for his card, and told him I would be glad to send him some research about how weight isn’t linked to health, how eliminationist language isn’t helpful, and maybe we could emphasize healthy habits instead? Turns out he is the State Commissioner of Health. Then I posted about the interaction on FB with the commentary that fat people have the right to exist, and that no body size is better than any other. I’m feeling loud and proud today! !